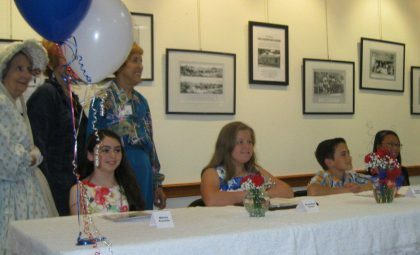 Winners of The 2016 Pine Castle Woman’s Club Fifth Grade Essay Contest were celebrated at a luncheon hosted by the Pine Castle Woman’s Club on April 13, 2016. 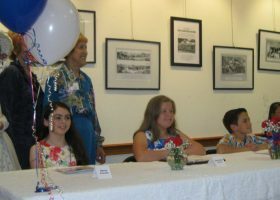 Essay contests winners: Olivia Casola, Christina Cross, Taylor Dehlinger, and Suzhanne Lorber are pictured from left to right. 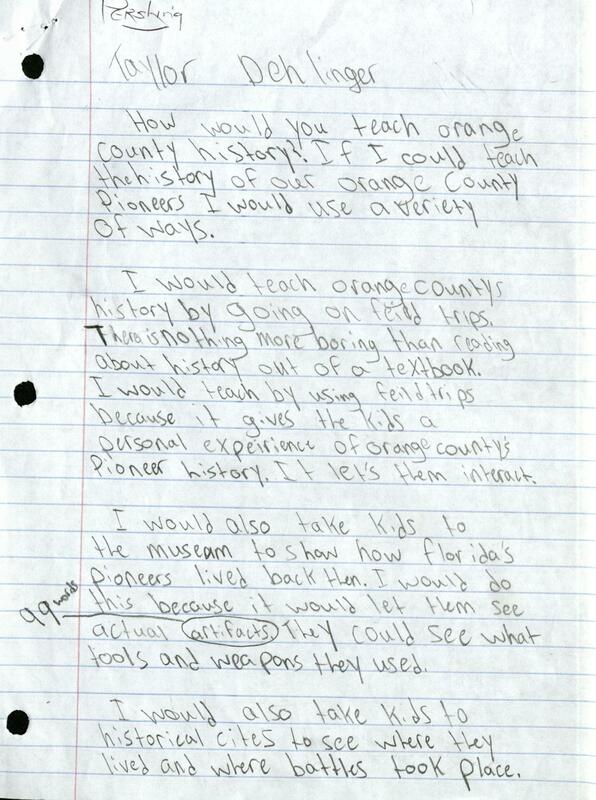 Students wrote original essays on the theme: If I Could Teach the History of Our Orange County Pioneers…. First prize winner, Christina Cross, received a plaque for her school and $100.00. Second place winner, Suhzanne Lorber, received $75.00. Third place winner, Olivia Casola, received $50.00 and merit winner, Taylor Dehlinger, received $25.00. School representation included: Dr. Kreil, Principal of Blankner Elementrary School, and Blankner educator, Ms. Heinz; Paula Downey, Principal of Cornerstone Charter Academy, and Cornerstone educator, Mrs. Loveland; Bernadette Jaster, Principal of Pershing Elementary School, and Pershing educator, Patricia Fisher; Pamela Crabb, Principal of Shenadoah Elementary School, and Shenadoah educator, Mrs. Grant. Mrs. Cathie Clark, wife of Orange County Commisioner Pete Clarke, and Ms. Cindy Brown, representing Congressman Daniel Webster, also attended the luncheon. 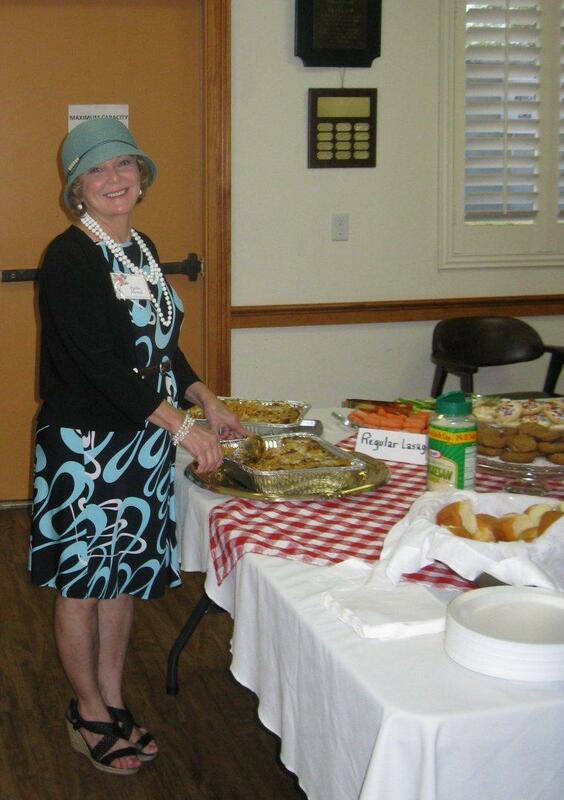 Pine Castle Womans Club member, Tommie Hosier, presented “Mrs. Mary Johns Walker”, the life of an early pioneer. Tommie Hosier as “Mrs. Mary Johns Walker”. 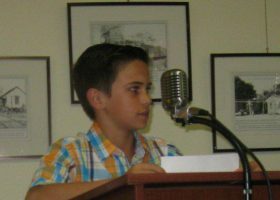 Listen to this presentation of local history narrative, storytelling, and oration of original essays on the history of Orange County by our future leaders. LISTEN Part I (18:51) Introduction and “Mrs. Mary Johns Walker”, presentation part one. LISTEN Part II (13:31) “Mrs. 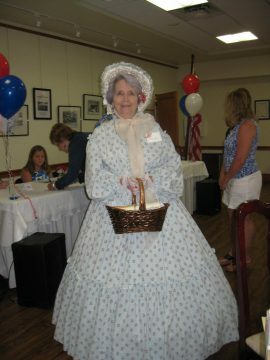 Mary Johns Walker” presentation of pioneer life by Tommie Hosier. 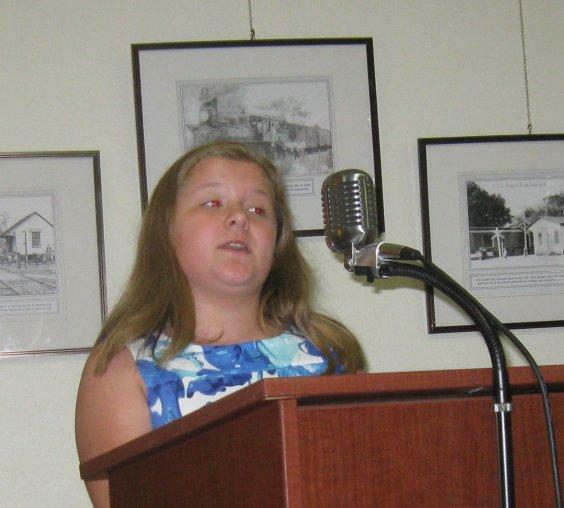 LISTEN Part III (6:34) Statement by Pine Castle Woman’s Club Essay Contest Event Chair, Ginni Christopher. 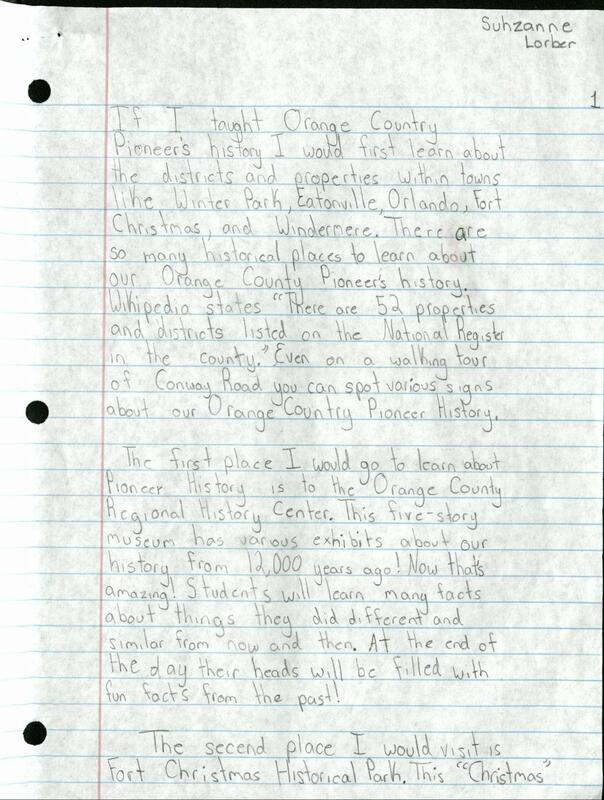 LISTEN Part IV (17:46) Student oratory of their award winning essays: If I Could Teach the History of Our Orange County Pioneers…. Presenters are in alphabetical order by school name. Blankner Elementary Pine Castle Woman’s Club Fifth Grade Essay Contest Winner Olivia Casola. 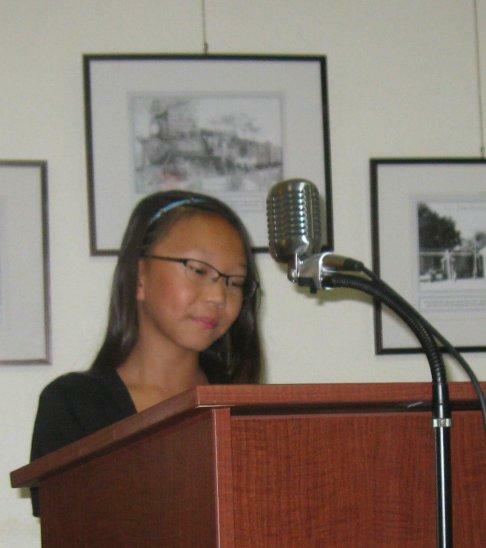 Read Miss Casola’s award winning essay. 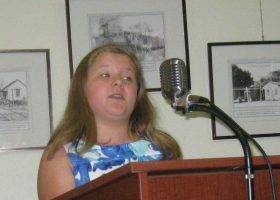 Cornerstone Charter Academy Pine Castle Woman’s Club Fifth Grade Essay Contest Winner Christina Cross. 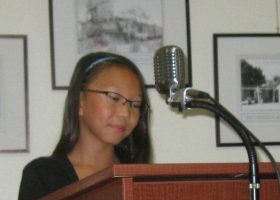 Read Miss Cross’ award winning essay which placed first in the contest. Pershing Elementary School Pine Castle Woman’s Club Fifth Grade Essay Contest Winner Taylor Dehlinger. 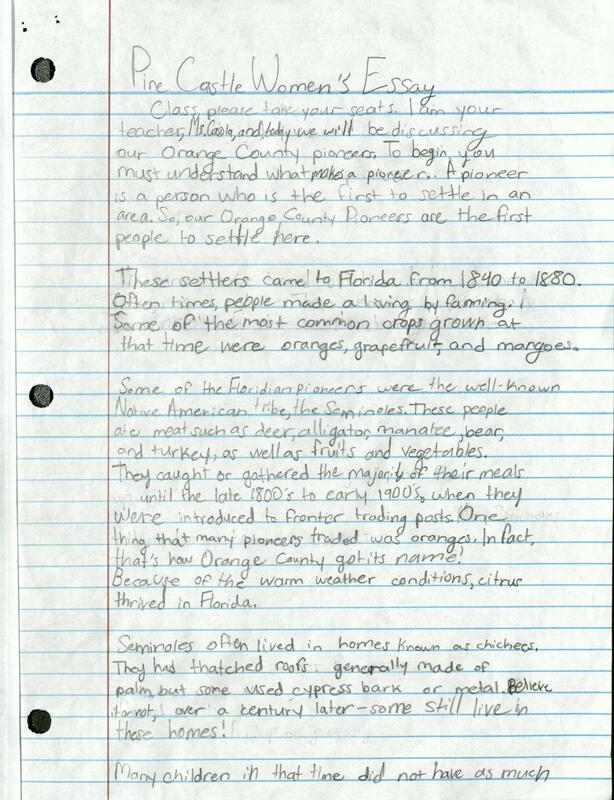 Read Mr. Dehlinger’s award winning essay. 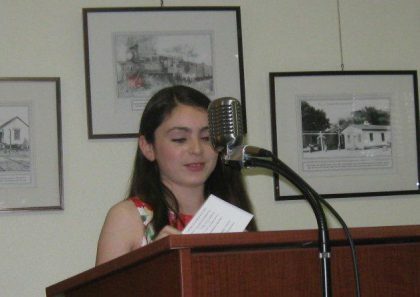 Shenadoah Elementary School Fifth Grade Essay Contest Winner Suzhanne Lorber. Read Suzhanne Lorber’s award winning essay. 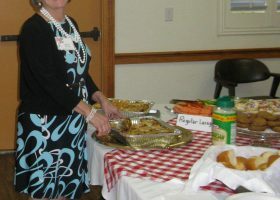 The students and their guests enjoyed a delicious luncheon of homecooked lasagna provided by the Pine Castle Woman’s Club. 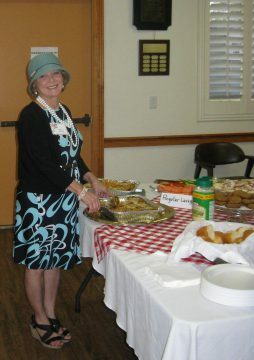 Pine Castle Woman’s Club member, Ruthie Harrell, is pictured above serving as luncheon hostess. Ginni Christopher pictured above center chaired The Pine Castle Women’s Club Essay Contest and Luncheon. 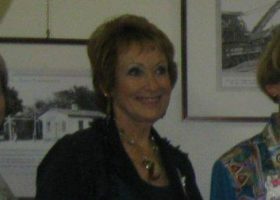 Gail Padgett, pictured far right, is the President of The Pine Castle Woman’s Club. 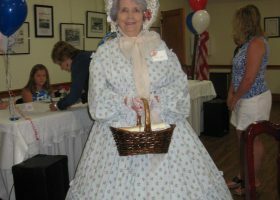 Pine Castle Woman’s Club member, Tommie Hosier, is pictured to the far left in her pioneer woman costume. Pine Castle Woman's Club 5th Grade Essay Contest, April 13, 2016. Excerpt from Shenadoah Elementary School Fifth Grade Essay Contest Winner Suzhanne Lorber's essay. Read Suzhanne Lorber's award winning essay. 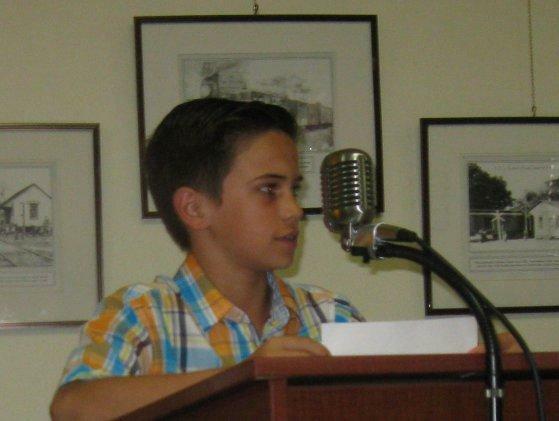 LISTEN (17:46) to the student oratory of their award winning essays: If I Could Teach the History of Our Orange County Pioneers.... Presenters are in alphabetical order by school name. 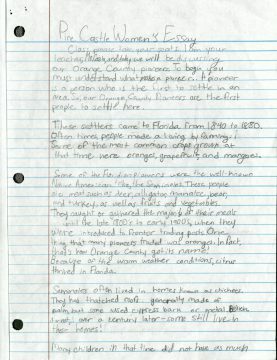 Excerpt from Pershing Elementary School Pine Castle Woman's Club Fifth Grade Essay Contest Winner Taylor Dehlinger's essay. 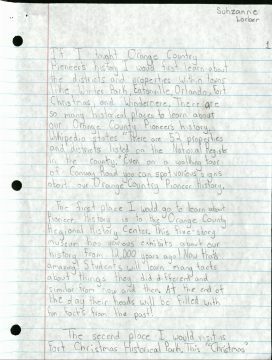 Read Mr. Dehlinger's award winning essay. 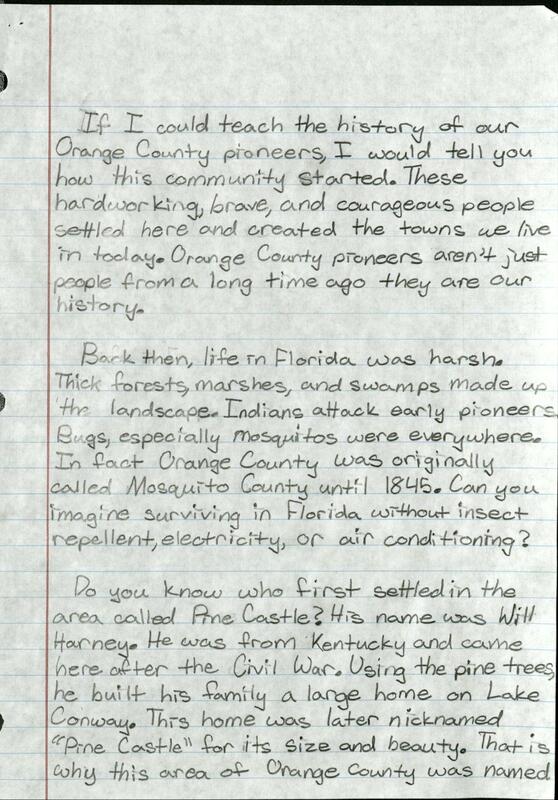 Excerpt from Blankner Elementary Pine Castle Woman's Club Fifth Grade Essay Contest Winner Olivia Casola's essay. 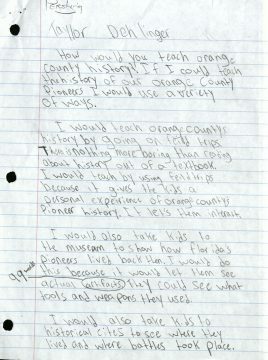 Read Miss Casola's award winning essay. Like many of the pioneers who came before me, I am proud to be part of this great community and am grateful for their contributions. I honor those who came before us by continuing to build our community, being involved, giving back, keeping our lakes clean, and protecting the environment, and I am proud to be an American, a Floridian, a citizen of Orange County, and a resident of Belle Isle. I pledge to work to build this community and in doing so honor those pioneers. 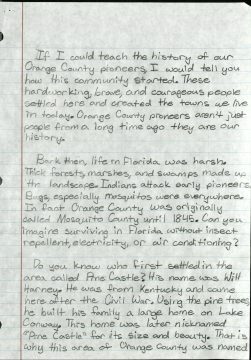 Excerpt from Cornerstone Charter Academy Pine Castle Woman's Club Fifth Grade Essay Contest Winner Christina Cross' essay. 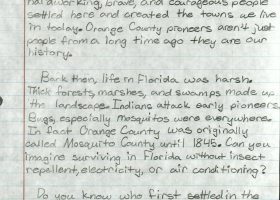 Read Miss Cross' award winning essay which placed first in the 2016 contest.